Just had a look at what has happened this week so far and it appears as wave [i] peaked at 1371 on Monday and we're currently in wave [ii]. I'm not sure whether it's already completed at 1342 or if it's only wave (a) of [ii], i.e. that wave (c) is going to test the support area between 1330 and 1340 once again next week (similar to what happened mid April (1302 and 1294)). 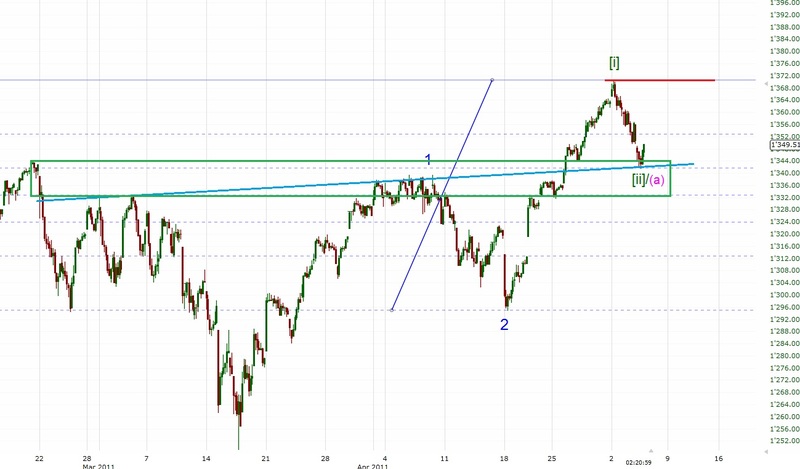 Whichever short term count is correct in my opinion the support area around 1330-1340 should hold to see more upside (to 1400+) later this month. If we break below this area I might be wrong and something else is underway. 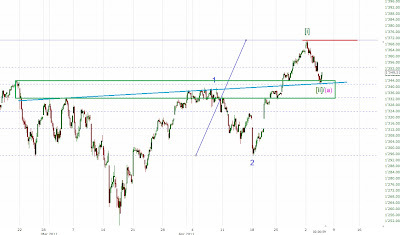 A convincing break above 1371 confirms that wave [iii] to ~1410 is underway.